Project: Building a cheap NAS, part 2 » Blog Archive » JADOTA – Just Another Day Of The Admin! Besides the list of requirements, we would also like to use the ‘best of breed’ when it comes to chipset and vendor and all this for a reasonable price. ; We have to watch the budget. So we would like at least our network interfaces to be Intel made. There is no strict set of vendors we would like to see represented on our motherboard, but if we have the choice out of several models this factor would be decisive. As we are looking to build a NAS that can support up to 20 drives, and even more if we want to introduce a separate cache or log disk, the motherboard must meet certain requirements regarding the expansion slots. 6 onboard SATA ports is a bare minimum and the motherboard must at least hold two, wishfully three PCI-E 8x or 16x expansion slots. Two SATA controllers that each hold 8 ports, together with the onboard 6 SATA ports would allow me to connect up to 22 SATA devices, which is exactly what i need. The last slot is there to facilitate a future expansion of the network interfaces. Supporting one XEON X3400/L3400 series or Core I3 series processor in a LGA 1156 slot, it offers enough processor performance for our needs. We were advised to be sure it was a 1.02 Revision, as this revision supports the Intel I3-530 CPU. 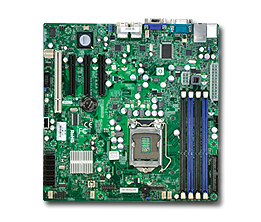 Besides the Realtek RRL8201N network interface for the IPMI support (read: KVM over TCP), this board also has two Intel 82574L Gigabit Ethernet controllers with Link Aggregation (LAGG) support. One of the Intel Interfaces (LAN1) can be assigned as dedicated iSCSI interface. The onboard USB connector allows us to connect an USB memory stick as boot device for our FreeNAS installation, saving SATA connectors for other purposes. And the onboard Matrix G200eW graphics card saves us an extra slot. This motherboard will cost us 165 euro, without the processor or memory. Due to chipset limitations, Kingston’s DDR3 Quad Rank memory will operate at 1066MHz in the first bank. Adding Quad Rank modules in the second bank will operate at 800MHz. Intel Xeon processors support ECC RDIMMs or ECC UDIMMs. Mixing Registered ECC and Unbuffered ECC modules is not supported within this system. Intel Core i3 and Pentium Dual-Core series processors support ECC UDIMMs only, they do not support RDIMMs. KVR1333D3E9SK2/8G is a kit of two 512M x 72-bit 4GB (4096MB) DDR3-1333MHz CL9 SDRAM (Synchronous DRAM) ECC memory modules, based on eighteen 256M x 8-bit DDR3-1333MHz FBGA components per module. Total kit capacity is 8GB. The SPDs are programmed to JEDEC standard latency 1333MHz timing of 9-9-9 at 1.5V. Each 240-pin DIMM uses gold contact fingers and requires +1.5V. Together with an Intel I3-540 processor (Boxed, with fan) we finalized the motherboards basic parts. This CPU offers 2 Cores, 4 threads running at 3,06GHz with 4MB of Intel Smart Cache. This should be anough to support our needs. If more power is needed we can always upgrade this processor or switch to the Intel Xeon-class processors. Total costs for the memory and processor: Intel I3-540 97 euro and the Kingston memory kit 8GB was 119 euro. Together with the motherboard this makes a total of 381 euro.